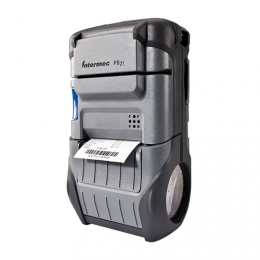 The Intermec PB21 is a robust mobile printer for sales slips, invoices, packing slips and receipts. It also quickly and crisply prints more graphically complex receipts. A standard 16 MB RAM ensure for a high print speed of more than 100 mm per second 203 dpi or 8 dots/mm, respectively. In this fashion, it expertly supports mobile processes in logistics and transportation facilities, as well as mobile POS applications during events and in retail. With a maximum media width of 57 mm you utilize it flexibly. Various sensors provide both current status and error messages continuously on the practical LCD display. Its robust housing reliably protects users against annoying downtimes. Repeated drop tests from 1.5 m onto concrete could not harm it. The IP54 certificate additionally confirms top protection against moisture and dust penetrating its housing. The PB21 enjoys a wide operating temperature range, so that even in extreme temperatures of -15 to 50 C, everything functions normally. Even vibrations do not affect performance. Therefore, you may also implement it into vehicles and onto forklifts.